The „paradise“state of radio-amateur work that exists today thanks to our long-time effort, offers a wide range of possibilities to the contemporaries, while the old-timers often cannot handle all of it correctly. The path to the recent state was not easy. The entire radio-amateur population has worked and fought in small steps till now. It is good to look back, to revive the memory, and show some details to our young colleagues, and refresh nostalgic memories of the old-timers. The old saying fits here: „a good knowledge of the past helps to better understand the actual state“. 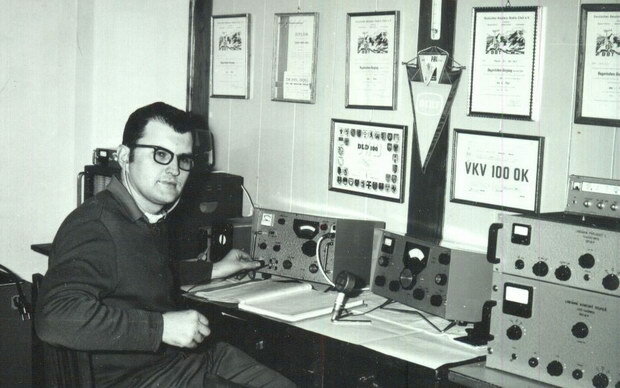 A detailed view on the state of VHF/UHF technology of the sixties has been outlined in PE-AR 8 and 9/2011, in a paper „How we ran VHF contests 50 years ago“. It is also possible to find this paper in this web page. 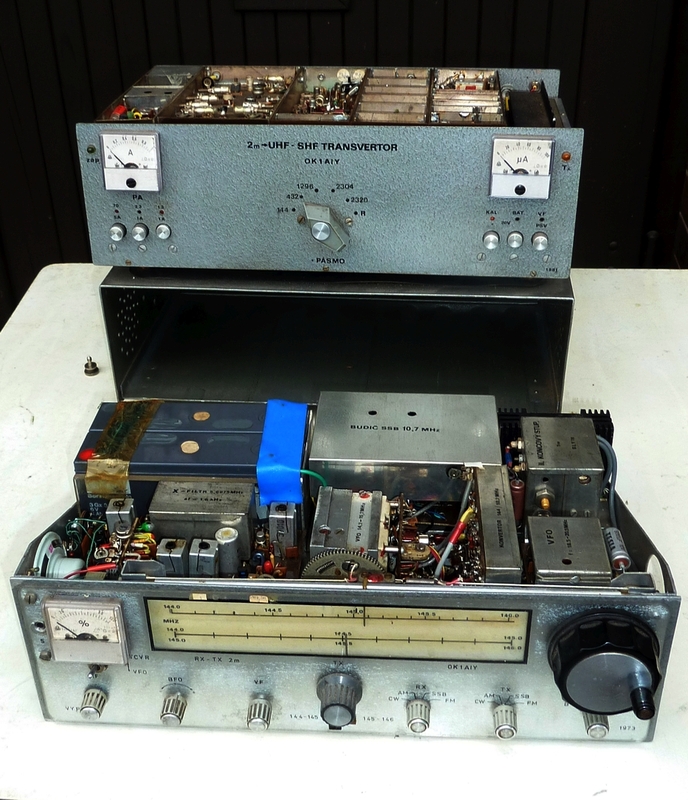 This article is a good introduction to the following description of SSB equipment which has pushed forward many VHF activities back then. Let us look how our equipment looked like in that time period. In the two-meter band , AM and CW was preferred on fixed frequencies generated from quartz crystals. In 70-cm band, active stations were counted on one-hand fingers. In higher bands, „solo“ oscillators served as transmitters, and super-regenerative receivers were common. Power levels ranged from fractions to units of Watts, and communication quality corresponded to it. Advantages of SSB traffic were known from short-wave bands and only time was needed to utilize SSB on higher VHF bands. A wide development activity was observed. Designers discussed their ideas and circuits on-band, or by letters. Communication was not so easy as today but the exchange of information worked. Everybody who tried to use his ideas had to solve similar problems. Here I will describe my way, and the readers can compare their attempts and designs. 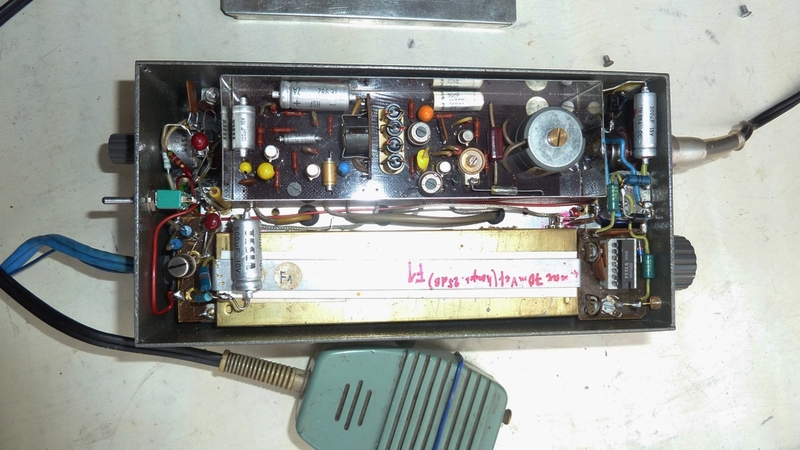 Figs.1 to 3, Photos of my first SSB transmitter of 1960's. Although everybody knows it, I would mention the basics of SSB, and its advantages. An AM signal spectrum contains the carrier wave and two side bands created by carrier modulation. A SSB signal has no carrier (rejected in a balanced mixer), and one of the side bands is cut off by a filter. Under 10 Mhz, the lower side band is used, over 10 Mhz, the upper one. It means that without talking to the microphone, there is no output power from the TX. In the receiver, the beat-frequency oscillator (BFO) signal is added to the mixer to the spot where the carrier sat in the TX. As the TX only generates one side band, in the receiver the mixer (also called product-detector) generates a legible audio output even when the other side band is missing. Advantages are many: there is no interference due to many carriers even if signals are close, and more signals can be used over a narrow band. All TX power is concentrated into one side band, so there is saving of energy. It is said that the communication efficiency of SSB is the same as CW. If our TX signal is correctly tuned, we can step into a running communication without affecting it. With AM or FM this is not possible. To make a SSB signal legible and not distorted, all amplifiers must operate in a linear mode, without an overdrive. This, however, is not a disadvantage but a natural thing. It was an adventure to start the described design without any experience and materials and test equipment. The idea was to generate a SSB signal on a suitable frequency, and mix it with a variable frequency signal, to get an output at 2 meters. From the very beginning, the TX and RX blocks were separated. Such approach was the used also on short-wave bands, one complete block would be too huge, and the advantage was that the RX can be used immediately. 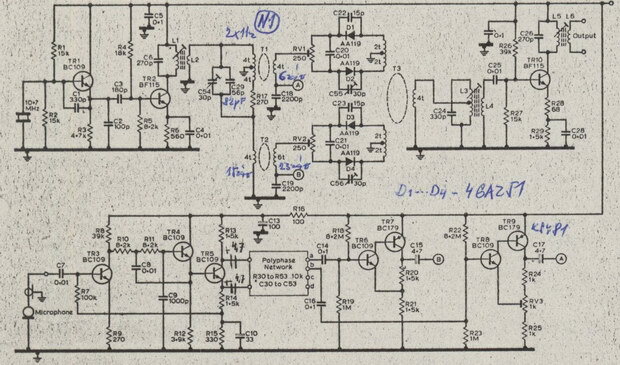 In AR magazine there were SSB filter designs published, but mostly at lower frequencies, and quite bulky. (Suitable for short-waves). One OM has made a good SSB filter but on 50 kHz. For 2 meters, such filter could not be used as it generated a „rake“ spectrum over the full band, a peak every 50 kHz. Another problem was how to find suitable quartz crystals. We managed to get crystals at 500 kHz with needed frequency differences, and a filter was created of them. 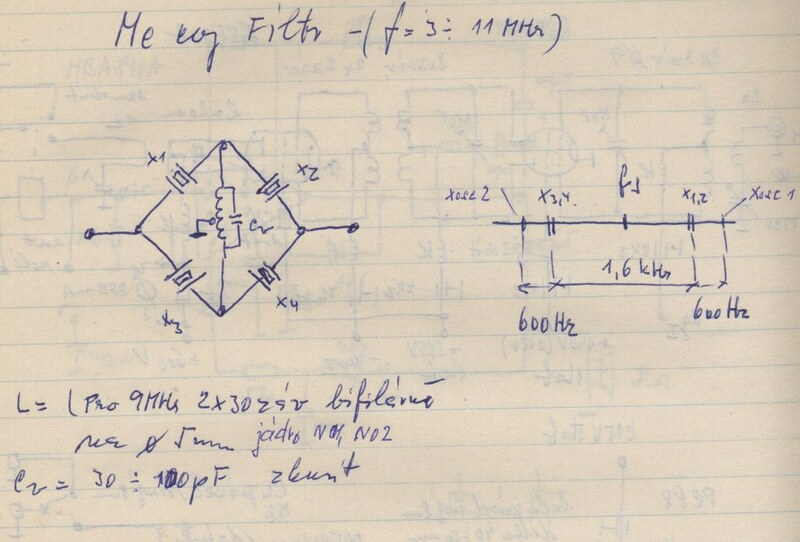 Also , VHF transistors were then not available, so the design utilized vacuum tubes, Figs 1...3. It consumed a lot of power and was bulky. Vacuum tubes were then at their peak performance after a long development (Semiconductors arrived only in 1980's). Some vacuum tubes are still good now, and we enjoyed them much. 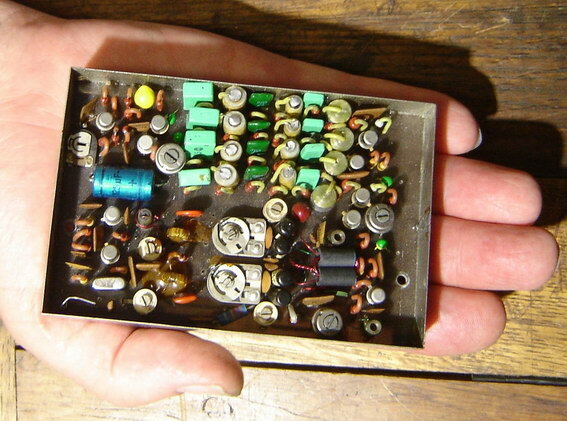 Building a transmitter took a long time, several years. Here the description takes only a couple of lines... The goal was to get the equipment into operation, and gradually improve it under operation. During that time, the fall brought improved VHF propagation, and 2-meter band was alive even during the day hours. I was lucky to find a nice QTH in the AC room of „Panorama“ hotel in Benecko, 900 meters above sea level, and an open view from the South to North-West. My antenna systém was not too decorative for a nice hotel, but back then the human relations were somewhat warmer. Hotel guests were not annoyed and hotel management did not protest. Mr.Klouda, hotel manager, even gave me keys from the AC room, so I could visit my equipment any time. I liked it much, today I doubt it might be possible. And in the AC room it was warm any time.. Having mentioned „human relations“, I think the young generation would not understand, and old timers forgot. Many things were not available to buy in the shops, and we were used to reuse or repair anything. People knew the value of things, and faulty things were only discarded if a repair was no more possible. There were good experts who could repair almost anything, and even use discarded stuff for something useful. They were recognized by the public, and having one as a colleague at work was a really good luck. If managers could recognize such individuals is hard to say but any boss knew his subordinates' capabilities. We had to do many things by our own hands, so creative people were needed. We knew how to improvise in design, one could learn from others, and for a long time I have used such knowledge well. By the end of 1960's the transmitter was not finished. It had no front panel but it was tested in all operation modes. SSB was not yet common, so the main mode was AM. Among the stations in our region the SSB was not known, so when OK1AHO started with it, other stations cautioned him that „his modulation is poor“. In that time we were taking part in sports events and car races and used our equipment for „community communication services“. Our cooperation eased the organization, and we could test our equipment in various conditions. We had no idea that the saddest „communication service“ was lurking. The week after 21 August 1968 was infinitely endless. Of course, it was an opportunity to protest Russian occupation, and many hams faced problems later. I do not want to tell more now, but many people do not want to recall and the nightmare will follow us till death. As the time passed, designs saw technical improvements ,like the SSB signal generated at a higher frequency, in practice 10 Mhz. 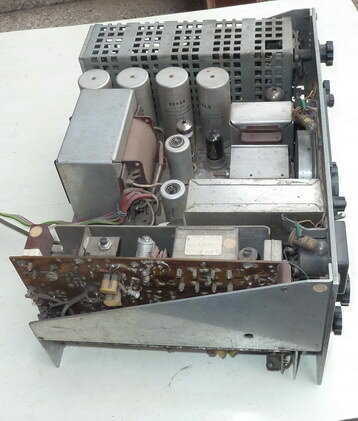 The German DL literature presented a full exciter design, with a VOX and Anti-VOX, with transistors on a PC board. 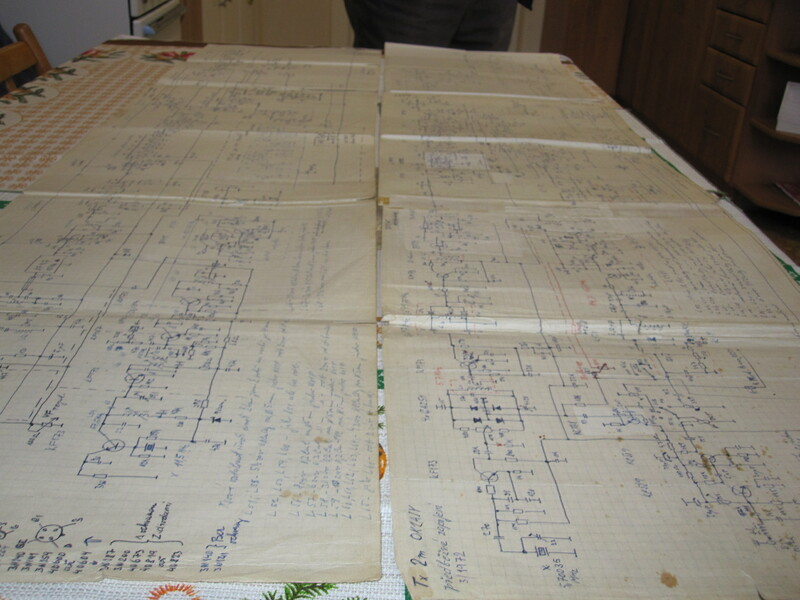 The board was large (today it could carry a complete transceiver), and allowed experimenting. In our country it was distributed fast under the name HS1000 (Fig.6). A simple quartz filter designed by W1ICP became known as „McCoy“, Fig.7. 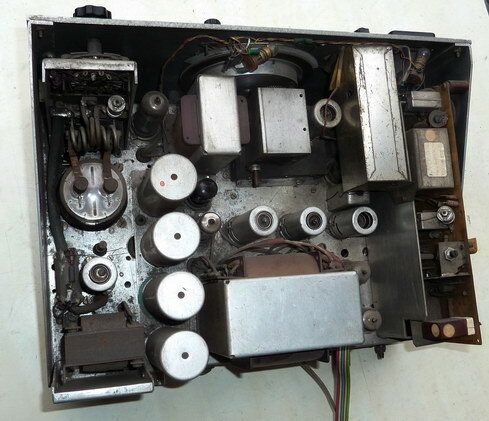 I used Soviet-made crystals at 5.744 Mhz in bakelite covers that allowed frequency adjustment by a glass brush or iodine. The design was easy and nice, the only difficult element was the bifilar coil on a core, tuned to the operating frequency by a parallel capacitor. (one must not forget to make the center tap... this did happen). We have found that also crystals from RM31 radios could be used, B000 to B900 series. If we could find a larger quantity of them, we could select their frequencies even without opening covers. Then it was easy to build McCoy filters . Aleš, OK1AGC, had a good experience from HF bands, and was able to show the frequency response on a scope, so by varying C and R values, the response could be cleaned. 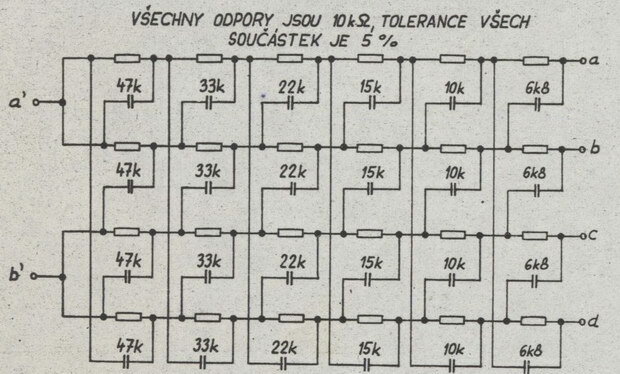 Starting in 1970's, also TESLA Hradec Králové (a state company manufacturing quartz crystals and ceramics) had introduced quartz filters for 9 and 10.7 Mhz, for the cost equal to a monthly salary (today for this money one can buy a commercial transceiver or two...). During that time period, 2m transceiver production exploded. (likewise in the former GDR, East Germany). Such devices were not available in shops and there was no good outlook for the future. There was a story about a Czechoslovak mariner bringing his brother (a short-wave ham) a transceiver. After some time, he sold it as his brother mariner brought him a newer and better transceiver. One can imagine what might follow. Not many people had a friend who would work on an oil drilling rig, or in diplomacy, so most of us manufactured transceivers at home. People were creative and proud of their skills to make a good TRX by their own hands. Some looked like professional products and worked very well. Successful designs were described in magazines (named Klínovec, Fantom). Later Kentaur followed which was quite good after minor modifications. Its author, Jirka, OK1WBK, had manufactured a perfect printed board, multiplied in masses. Some own it till today. This is a bit a hyperbola but in 1974 Kamil Hříbal, OK1NG, launched a mass production of 2 m transceivers. Following a very successful model by Václav, OK1MWA, he derived a design named „Sněžka“, and in Hradec Králové Small Square, in facilities owned by District Committee of Svazarm (Union of Cooperation with the Military) he started the first 10-piece series. The workshop included also a PC board-making line in which OK1MHJ's XYL worked, so 11 units were made. 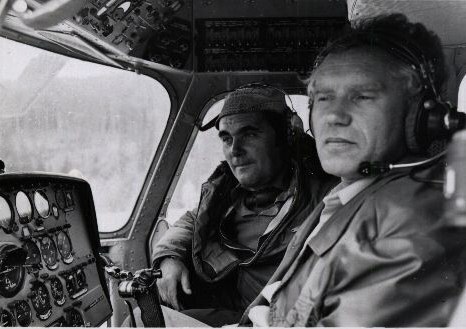 Kamil, however, worked with a limited access to materials, and himself was no enthusiast in VHF. He even claimed that SSB is not suitable for VHF operations. 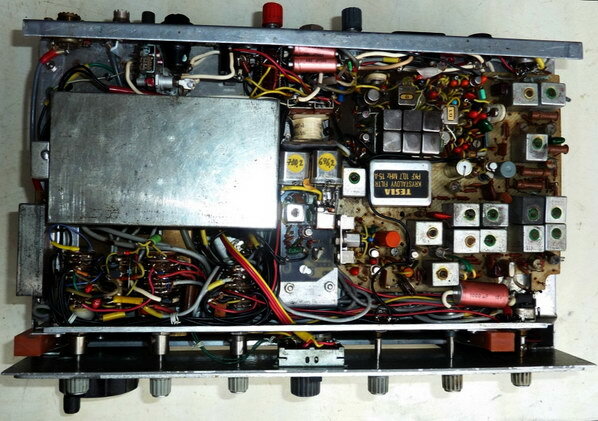 He disliked „sardine cans“, the chassis was taken from a short-wave transceiver „Petr 103“ , the IF amplifier was taken from „Otava“, all stages used KSY 62 transistors, and N05 ferrite cores. 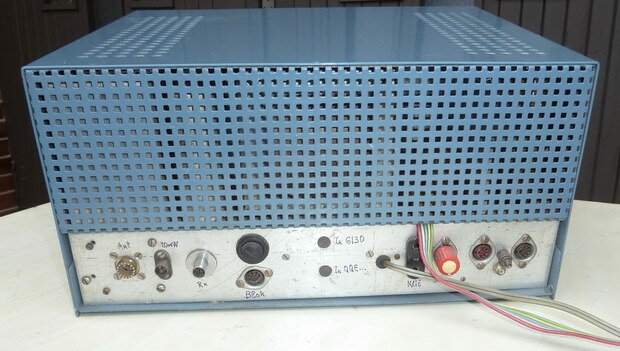 The mentioned unit No.11 we were bringing to life with OK1MHJ, by using better transistors and good cores the features gradually improved, and finally we got a quite well-functioning transceiver. We added a small trick, the VFO signal was injected via an emitter-follower, along with a signal from a quartz oscillator, to the gates of MH7474 integrated circuit. 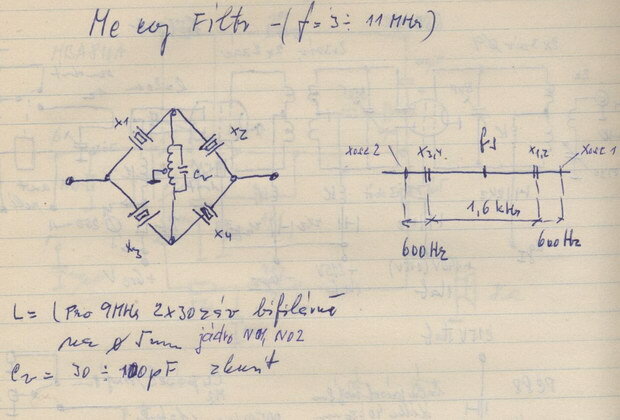 The quartz oscillator ran on a frequency chosen so that to cover 144-146 Mhz, the output from the IC was 4...6 Mhz. Then we could connect an ordinary digital frequency counter and we had a „fake digital scale“. 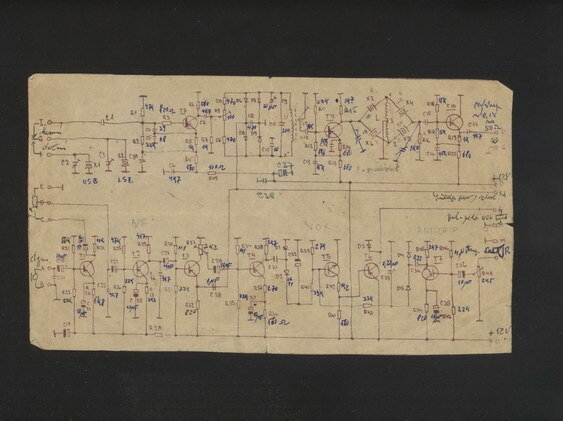 It was curious that this circuit did not generate interfering whistles. 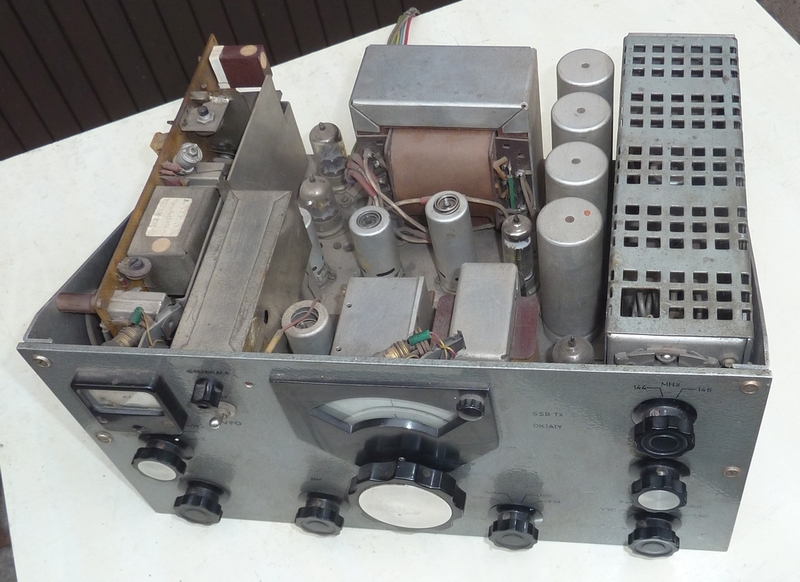 With an added IF amplifier for FM mode, this was a really nice piece of equipment. Several years later all that was replaced by Petržílka's „Sněžka“ from Radiotechnika company which was comparable with anything created by world renowned companies. 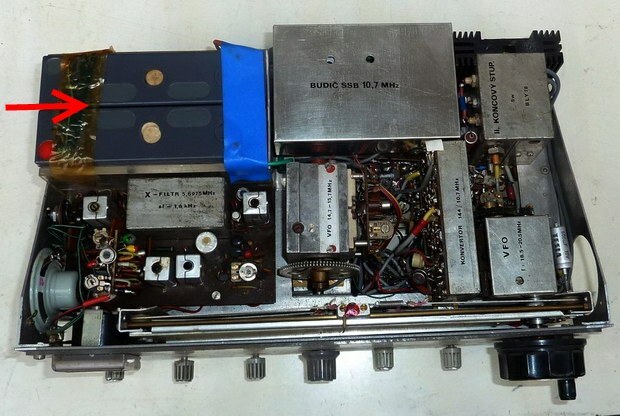 More info on this transceiver can be found on OK2KKW.com page, see external references at the end of this paper. I have somehow deviated from describing my TX. Along with the new SSB exciter at .5.744 Mhz I had to modify oscillator frequencies so I could cover the entire band. It was of course cumbersome but I knew I had to do it. In addition to measuring I monitored my signal by the receiver, to check there was no spur. I would like to mention the balanced mixer with 144 Mhz output. 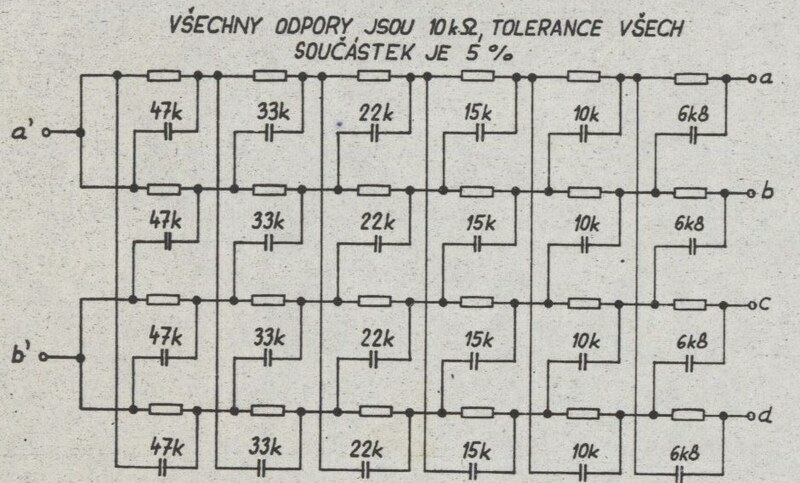 I used 6CC42 twin triode which was designed for such balanced circuits. The circuit had to be mechanically symmetrical and fine tuned , then the unwanted signal was really well rejected. Any tiny mis-balance was immediately seen. 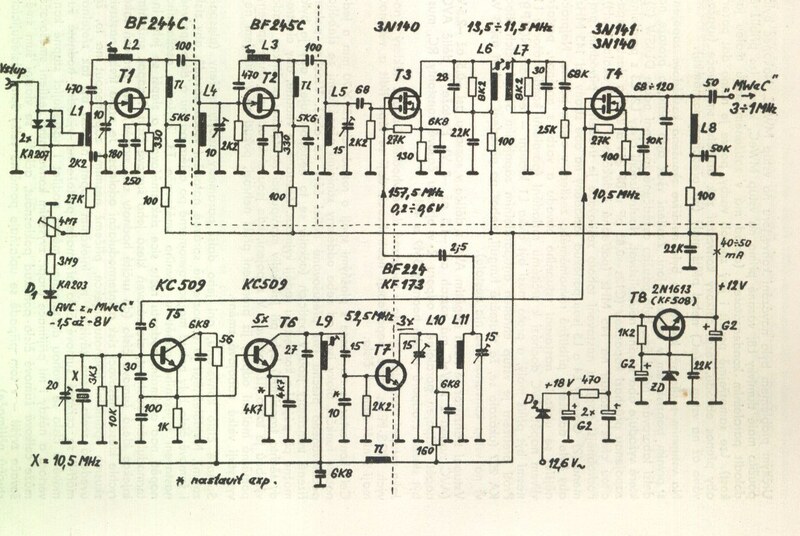 The following 4-stage amplifier had inter-stage band-pass filters. The filters were 2 Mhz wide and no tuning was expected. A good improvement was the new available EF 184 that replaced the old EF80. 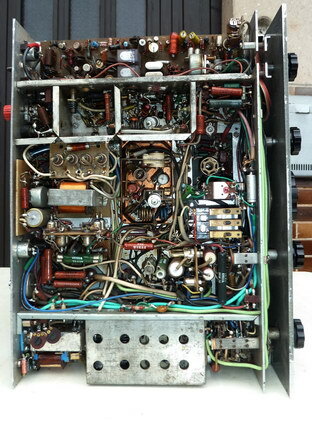 The new tube had the same pinout, only plug in and fine-tuning was needed. The following stage was EL83, then QQE 03/12. In my final PA I used GU29, later GI 30. The last one was only specified for up to 80 Mhz but it worked, and it was easily available. Operation points of the last two stages were set by potentiometers on the rear panel, from a regulated negative voltage supply. Steady-state currents were monitored by a front-panel meter. Also the IG1, grid current, to monitor an overdrive. As at the fifth grade of my high school we were taught about linearity and amplifier classes A, AB and B, I could test it at home. The mechanical design of the resonant circuit, output coupling, correct screening, reflectometer probe and antenna relay, all required a good care. At the start it happened that the set screw in the tuning knob burned my finger, but there was no output power from antenna connector. (I had to make the tuning shaft from a plastic-Novotex). I tuned and tuned till there was no more improvement. As I could use Rafena DVM106A RF voltmeter with a professional coaxial test head, I had no problem with loading my TX with a 70-Ohm load and calculating power from voltage. My 55W I deemed as a giant power. I had no idea that in the future there would be the QRP category with a 100 W limit... The long time when vacuum tubes were used was quite impressive. The magic of glowing cathodes and the smell of ozone from open PA circuits plus burning dust fragrance brought an adventure feeling. Such experience will be missed by the users due to new progress . 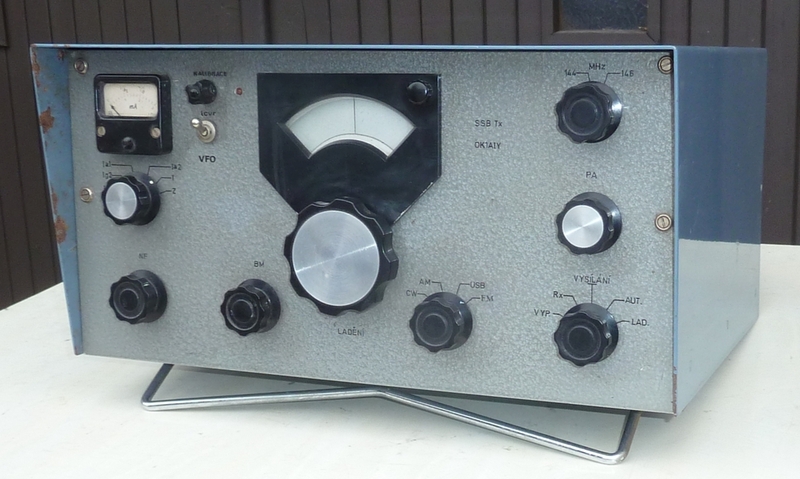 At the beginning 1970's my SSB equipment was fully functional including the front panel and enclosure. A problem was found with a mains transformer. The commercial one from Dubnica factory was too large and also expensive. I have found a discarded M-core with a smaller size (after DIN standard). I have followed high-school instructions to calculate the windings and wound the transformer using a „novotex“ plastic for the coils. One wire size was just not available, so I used a novelty, a wire insulated in a green colored varnish designed for an easy soldering. Once used and loaded to a higher temperature, the transformer burned. Later I repaired it with a classical material. Still the size was no adequate and the next transformer was wound on one higher-size M core. I intended to swap the new transformer for the old but it never happened. Before one contest I decided to make sure my power supply would not fail. I attached another transformer by five wires, to only feed my PA. It was put into a paper box laid on the main enclosure, and stayed so over time. Another intended improvement was to replace the neon regulators, 11TA31 and 14TA31, with a series-connected Zener diodes. In one worst moment, one Zener diode „opened“. Fortunately the neon tubes were still at hand as spares, after plugging them in original sockets they saved the day. One funny event happened due to electrolytic capacitors in the power supply. 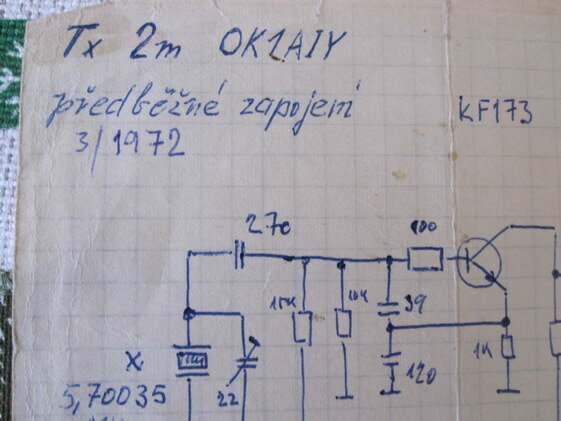 They were rated for 550 VDC but in operation they carried almost 500 V. At home the mains voltage was stable but during the 1971 VHF Contest on Žalý the gasoline generator stepped up the AC voltage, and one electrolytic capacitor puffed off its rubber plug. The witnesses remember the gray smoke shaped after the square hole in the enclosure that filled our tent. To save the contest I drove my motorcycle down hill home using field lanes (I would not say why), then filled my backpack with spare capacitors, auto-transformer (to reduce AC voltage), and my AVOmeter. After an hour we contested with a full power. Then we secured capacitors type TC521a and connected them in series for a safety. 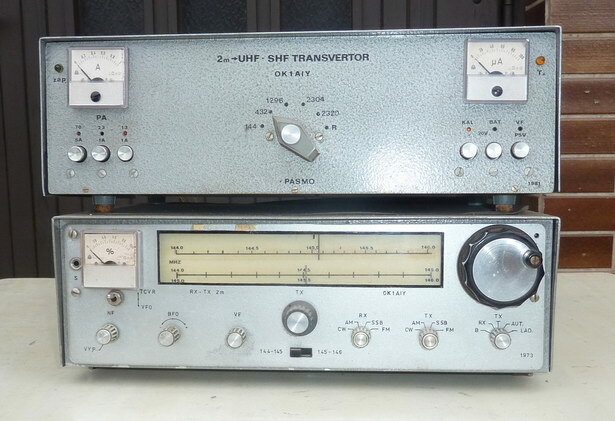 In that time, most VHF receivers utilized converters to German surplus receivers. Most popular were E10AK or FuG16. For 800 Kč I purchased a MwEc which was fully functional after a minor repair. It was a wonderful receiver, it has a perfect bandwidth control and the scale was quite accurate. In one Designer magazine I found a list of medium-wave stations across Europe. It was interesting to find them following indicated frequencies. This receiver generated almost no inherent noise but I would not point out its features to prevent being called an „old stuff lover“. A double-conversion converter built by Pavel, OK1 GV, in Vrchlabí, was just perfect. The IF receiver was tuned 3 to 1 Mhz, and the LO crystal was 10.5 or 21 Mhz. 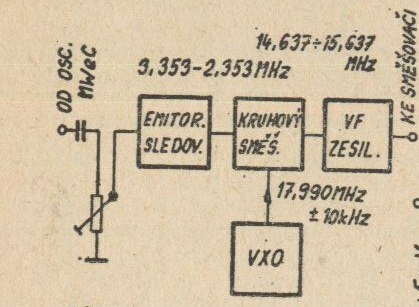 Modifications to MwEc for SSB operation was described by Jirka OK1FT, in AR 9/1959, and using the sensitivity control from zero, this receiver became almost a measuring instrument. 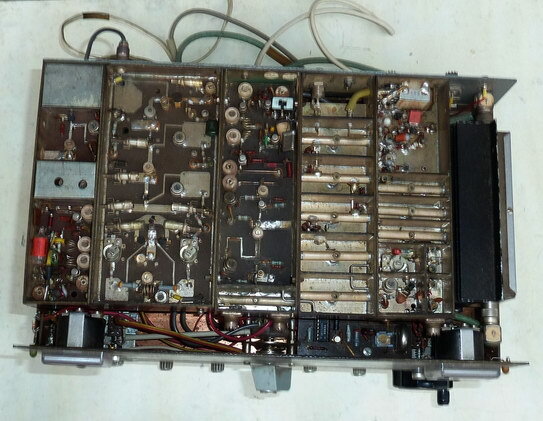 Even though the described equipment worked quite well, in 1972 I succeeded in joining both units into a transceiver, by connecting the RF tuning from TX to RX (MwEc). From a suitable point of the tuned oscilator in MwEc receiver, I picked up a signal via an emitter follower into a „premixer“ circuit as shown in Figs. 13 and 14. 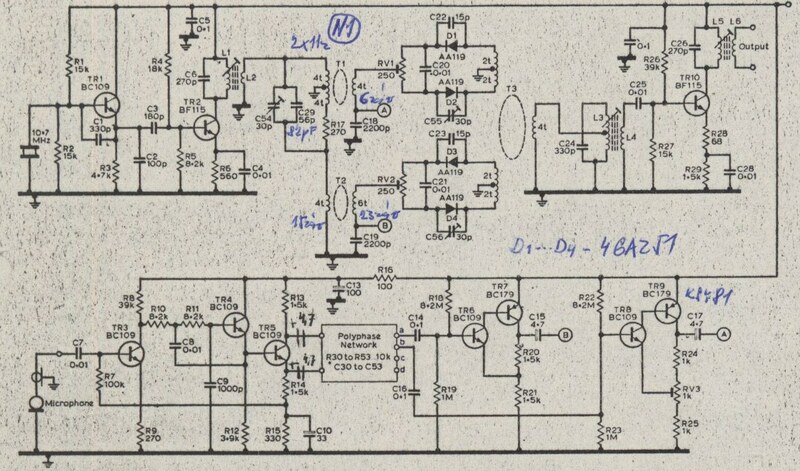 A tunable crystal oscillator at 17.995 Mhz could set a zero beat, so both TX and RX operated at one frequency. The only MwEc was used to tune signal frequency. (A fine tuning was also possible by receiver BFO). In that time , VHF SSB operation in Europe was common and during improved fall propagation conditions, tens of far-range QSOs were possible. It cannot be compared with the recent state, the band was alive even during days. After several sleepless nights I felt a „pleasant“ tiredness. SSB station quantity grew also in the Southeast, so the mode switch on my front panel was set to AM only rarely. Signals were strong as everybody ran almost the same power. Every year I looked forward to the nice fall time- a nice radio-amateur period. The main control (Fig.16) is the tuning knob with a scale. (It was never finished, only pencil marks were drawn). At bottom right there is the switch, TCVR,LAD, RX, TX. The two last positions are „doubled“ by microphone push-button. The other „mode“ switch selects SSB, CW, AM and FM. 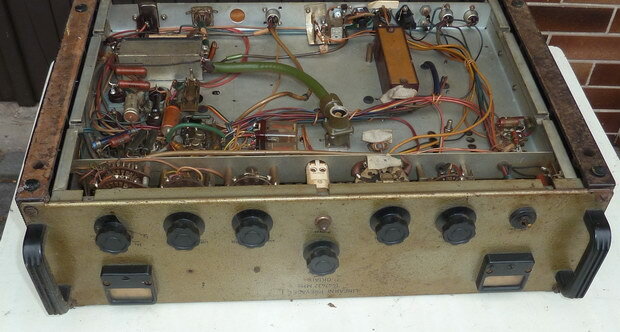 Next there is a potentiometer for a manual mis-balancing the balanced modulator. 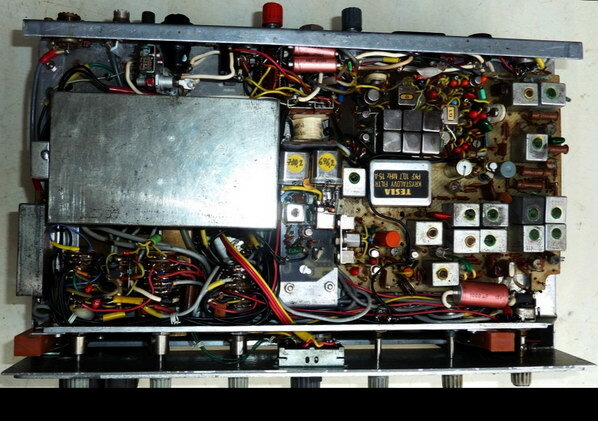 It generates a voltage 0 to 1 V, it was used from the start to adjust the modulator but was left for practical reasons. It allows checking with a RF power meter that there are no spurs generated in the power chain. When the potentiometer controls power output, the output power should grow smoothly without jumps. On bottom left there is the audio level control from the microphone. Above it there is a DHR3 indicator with a switch to monitor plate and grid current of two last amplifier stages, and also the forward and reverse power indication from the built-in reflectometer. On top right there is a switch for upper and lower MHZ on the two-meter band , under it the knob for the butterfly capacitor in the plate RF tank of GI30 tube. On the left there is the fine tuning of the mentioned 17.995 kHz oscillator for the added premixer, and under it, the VFO/transceiver switch. The indicator LED light, LQ100, was the first-generation of LEDs: the LEDs did not generate too much light, so in day light one needed to make a hand-shadow to see the LED active. (today, a LED under 10 mA current is blinding). The front panel design reminds the popular Collins KWM-2 face look. The start of 1970's was full of important events, technical and personal. It is unbelievable what all we could achieve but it is a correct saying „the work is best done when it has good results“. SSB operation was starting at 70 cm, so the first transverter was made, Figs. 17, 18. 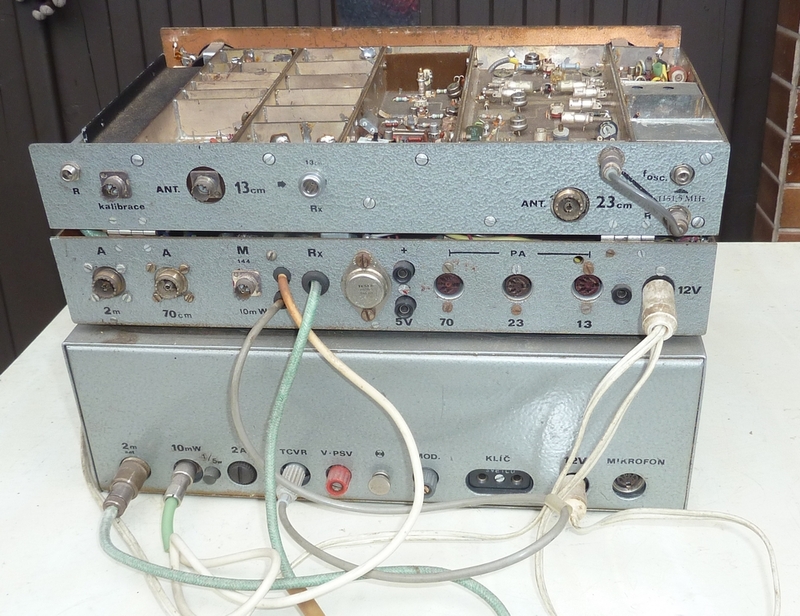 Two cnnectors were added to the rear panel of the described transceiver for 2 meters, Fig. 16. From EL83 amplifier stage some 50 mW power was coupled out by a 2-turn coil, 10 mm dia. . To the switch with three positions, LAD/TX/RX, one position was added , „transverter“. All handling was like on 2 meters, TX/RX switching by microphone push-button, only 2 m power stage was switched OFF. 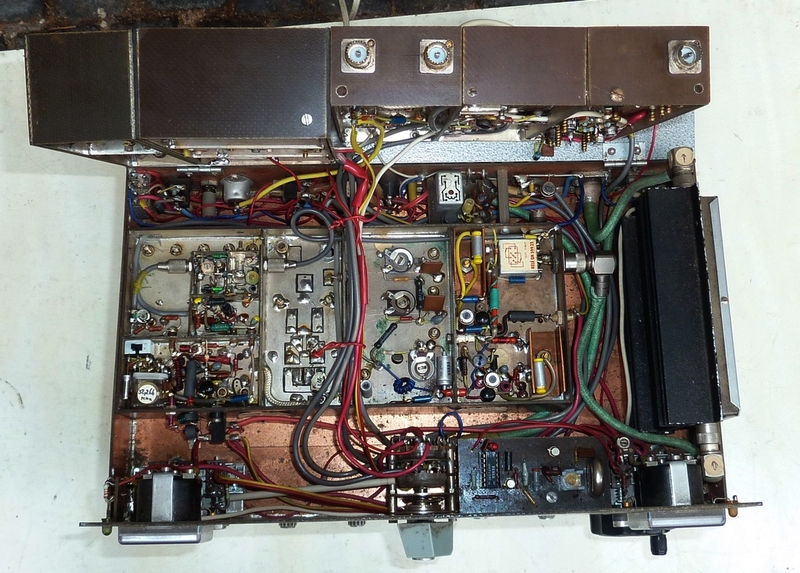 The separate transverter was fed from +13 V for TX, and the mentioned 50 mW into TX mixer. These two controlled the full equipment for 70 cm including the final stage. My first QSOs were with G3LQR, G3LTF, G8CFQ and F8ZW. Horizon started „opening“. For portable operations it was needed to have a battery-operated transverter as my equipment described needed 220 V AC to operate. Contests like BBT (Bavarian Mountain Day) required battery-operated equipment, and weight was also limited. 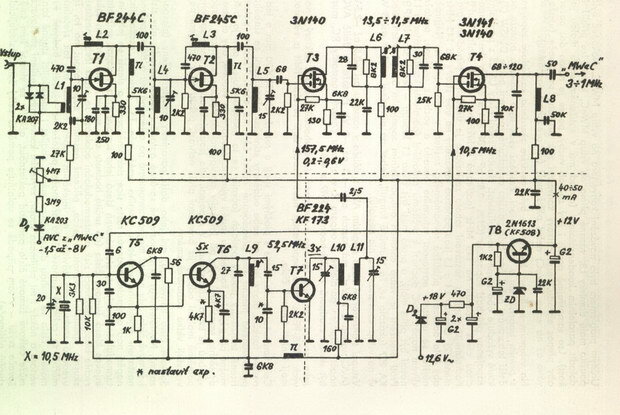 In that time transistors as well as other components were available to design small, lightweight and later powerful equipment. Foreign magazines presented first detailed descriptions, like from DC6HL in UKW Berichte which was followed also in my design (Fig.19). 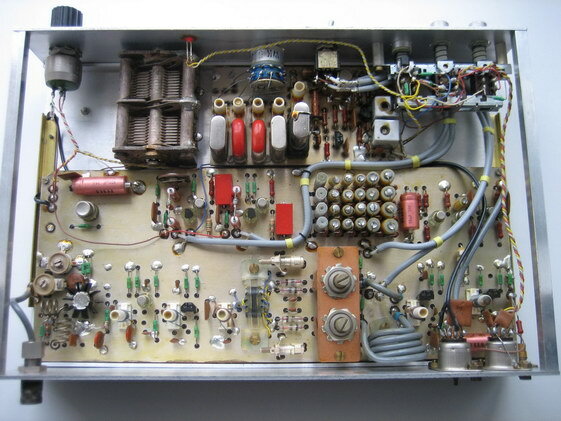 Its base was the IF amplifier at 700 kHz, taken from „Racek“ surplus equipment, using battery-operated vacuum tubes at 10.7 Mhz. I added other parts to make a transceiver. The twin-gate field-effect transistors 3N140 or cheaper RCA 40673 were new and easy to use, so I used them in many stages. Design concept was similar to the vacuum-tube transceiver. It was not a direct transceiver, it used a SSB exciter at 10.7 Mhz. Controls had the same functions, so the RF connectors were only swapped. During the following years I was gradually adding more transverters for higher bands (Figs.19,20). One exciter was not enough, so later others were added, IC-202, Mizuho SB-2M and FT-290R. Individual bands could be operated separately. New possibilities arose for VHF work. Thanks to the location of my operations location at Benecko (Fig.30), I had all chances to make good long-range QSOs at 2 m and 70 cm. I think about using the Es layer and aurora, occurring then often, as well as some via OSCAR 7 satellite. Mostly the „tropo-layer“ conditions happened, and some data cannot be forgotten. 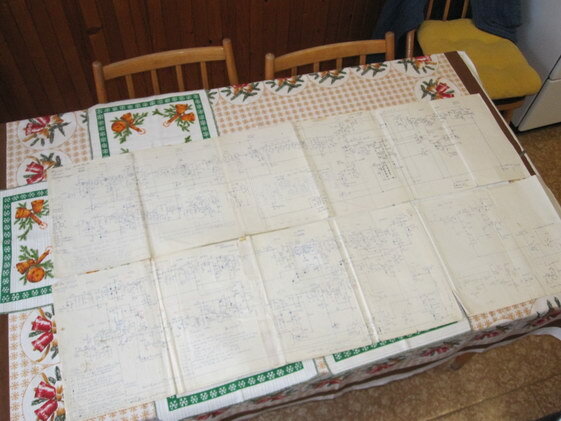 For example, 19-21.1.1974 or other, it is a fun to look into the old logs. 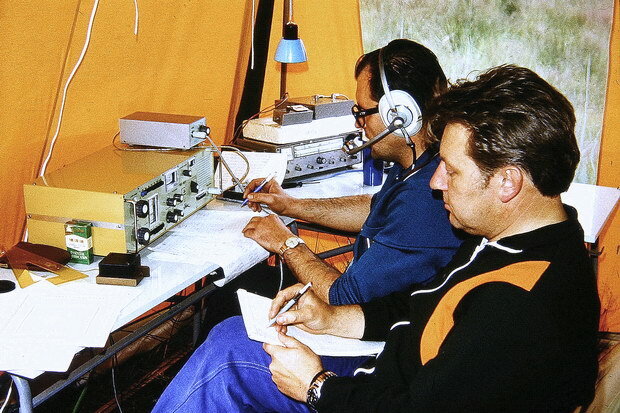 I remember a long line of Dutch stations waiting to make a QSO with me, minute by minute. I was happy to have a good communication with the equipment I made by my hands. A QSO is as we say only the „cherry on top of a pie“. My equipment worked very well, possibly better than now with a FT-790. Here I cannot give details on why I think it was. Also during the contests, the first I had in 1972 from Klínovec, I was very successful even though there was a competition. From Krkonoše, however, my results were never so good. The Golden Hill (Zlaté návrší) was not a „winning hill“, the exposed direction is shaded by Kotel (Boiler), so that a section of North-Western Europe was not open. Once a year (1981) during better conditions, I was close to winning a contest, but interfering station some 35 km away made me problems. 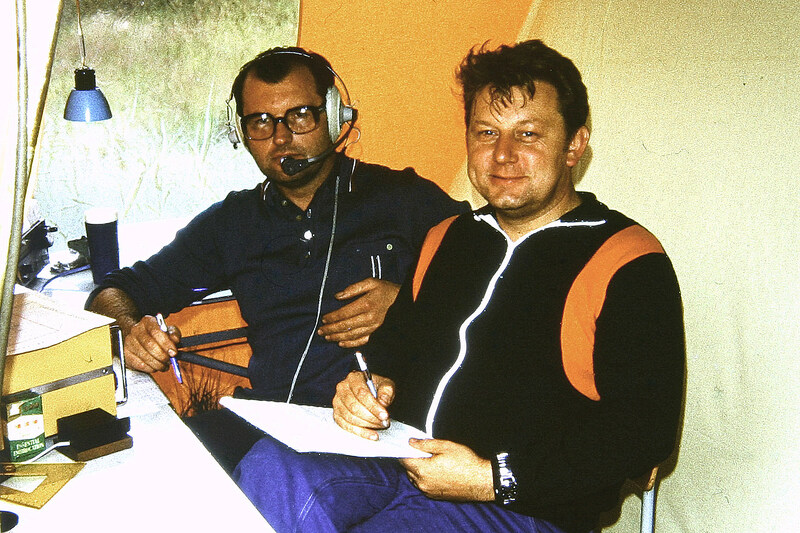 Only several more QSOs were needed but the interferer called CQ for long hours, and victory was claimed by Jirka OK1OA, from Ještěd, thanks to his operation skills. The described equipment I was using till 1980's , it was excellent but bulky, and as new bands were added, I had no room enough in my Š1203 van. SSB operations started then also on 23, 13 and 3 cm bands. So I used the old equipment in my permanent QTH and ended later in a depository. 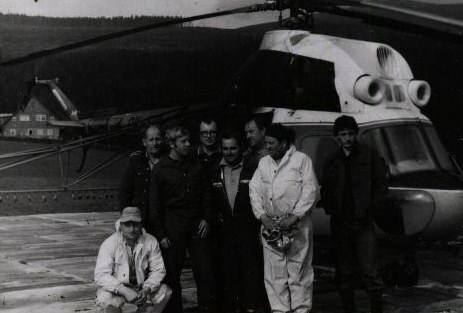 Fig.29 It was a lucky opportunity to have antennas at 700 meters above sea level. So we made a club station OK1KZN in the ham-shack of Jenda Skála, OK1UFP. 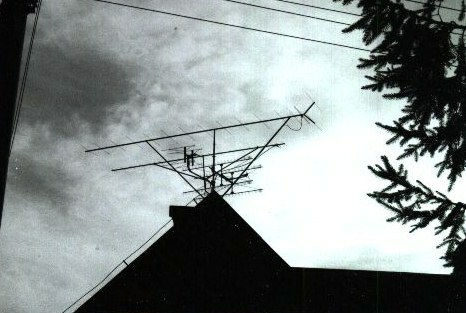 The antenna systém from 2m up to 3 cm was smashed by a storm in the 1980's. The above described filter method is not the only one to generate a SSB signal. It is the simplest, however, and a filter can be also used in the receiver. Such filters are also used in professional units. The phasing method has been used in vacuum-tube equipment in 1950's. The design was more voluminous, so it was no problem to use the phasing method in short-wave bands and later VHF. 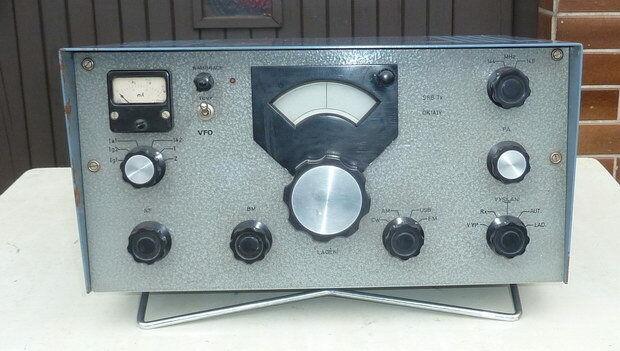 Pribin, OK1AHO, used it in his 2-meter equipment at the beginning of 1960's. Using solid-state devices reduced the size and in 1976, in Radio Communication magazine, 9/1976, a nice design was described in a metal box, 115 x 80 x 20 mm. The frequency is 10.7 Mhz which was very suitable for my transceiver design, so I tested it, too (Fig.32). 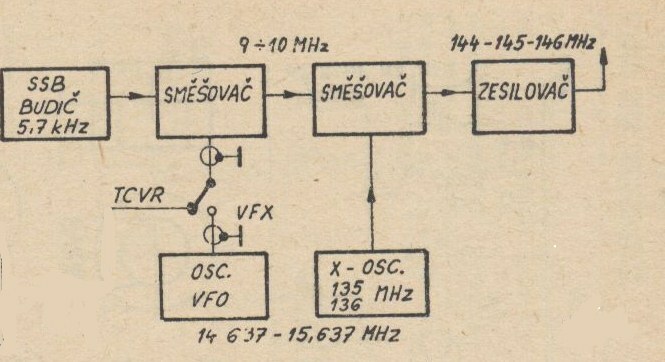 Mirek, OK2AQ, built his phasing SSB source directly on 144 Mhz (Fig.34). The author described his design as follows: „VXO runs at 16 Mhz and is multiplied by 9 times to 144 Mhz. There it is split into I and Q paths. The 90-degree phase shift is set by a quarter-wave piece of a coaxial cable. Two balanced modulators with GA206 diodes are fed the pair of low-frequency modulation signals, I and Q. As the audio phasing network a six-stage polyphase network is used. All components of audio spectrum must be shifted exactly by 90 degrees, over 300 to 3000Hz range. Outputs of both balanced modulators are summed: this rejects one of the side bands. To achieve 40 dB rejection, the total phase symmetry must be better than 1 degree, and amplitude symmetry under 1%. The signal is then amplified to 0.5 W for the next PA. 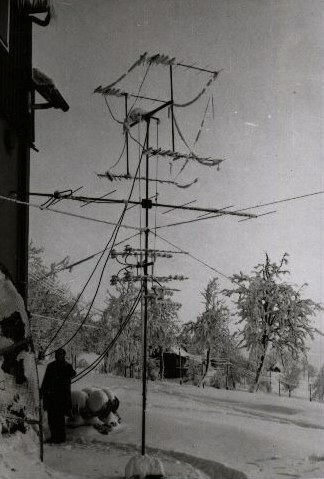 The transmitter was successfully used mostly for satellite-transponder traffic as a second transmitter for cross-band communication. „ From the above description it is clear that there are quite strict requirements to achieve a good function of phasing SSB exciter, and this is difficult in amateur conditions. Also in the case I described, after 10 years the SSB signal quality deteriorated and could not be improved by tuning. I had no access to apropriate test equipment ( a vector voltmeter with two probes I had no idea it existed). Listening on another receiver could not detect any cause, so I had to build another SSB exciter on the same-size board, with a 10.7 Mhz filter from TESLA Hradec Králové. The phasing exciter would not ever be checked, so it will remain as a „mute witness“ of the ancient effort. 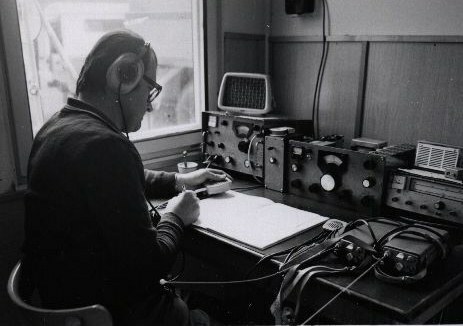 In 1970's such effort was common among radio amateurs, many hours and days we spent trying, without a sure result ahead. Today we can use integrated circuits, using the digital technology the resulting parameters are quite accurate, and a SSB exciter can be built with several or even one tiny circuit. This paper was also published in print in Practical Eectronics magazine, with permissione (PE/AR Magazine – Practical Electronic and Amateur Radio, Czech amateur magazine, in Czech).